When Overkill came out I all but curled into a ball of mewling joy. After years on the verge of extinction the cult were back in the heart of 40k lore. The attendant plastic deluge was like something from a beautiful dream. 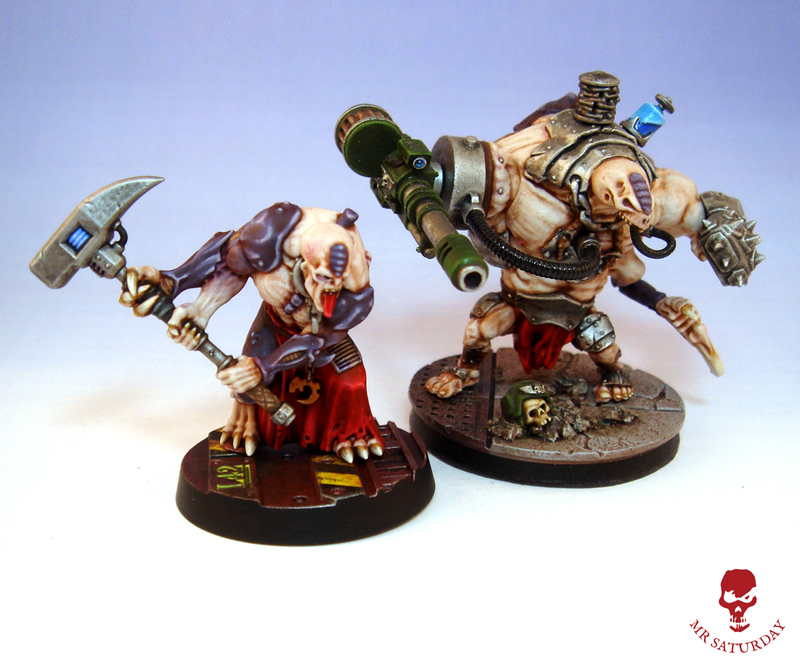 Since then the cult has enjoyed a huge resurgence, and as I write this a new wave of Genestealer cult minis are about to hit. I am target demographic man. 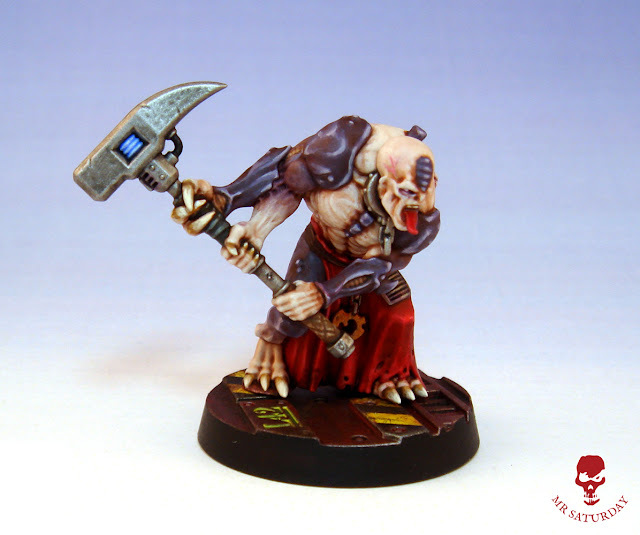 With the new cult list for Necromunda it gave me the ideal opportunity to paint an aberrant. I just love these less than perfect members of the cult. It shows even the hive mind makes a balls of things sometimes. You kind of feel sorry for them. In any case, the image of one of these charging across a gantry before burying it's power hammer in some gangers skull isn't something I was built to resist. I loved painting this guy. The miniature is just delightful. I'd have painted another right away if I hadn't a new project awaiting attention. I stuck to my cult scheme, but treated Sloth to a nice new Necromunda base. 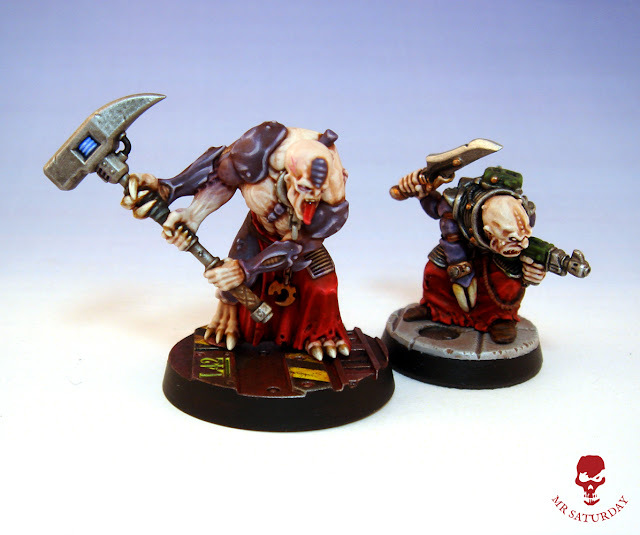 Here we have Sloth with my original aberrant from 2014, when if you wanted a cult you had to hunt for bits and out of production metal minis. At the time he was a proxy for a weapons team. His auto-cannon is magnetized in case I fancied another attachment someday. Not entirely sure where he fits in these days. Sloth still luvz him though. For my Oldhammer bros here's how he sits next to one of the original metal Jes Goodwin 2nd generation hybrids. I love that the new plastics have kept and expanded on the original aesthetic of the cult with the mining suits and a more industrial than military feel. At this stage I have more cult minis than a man could ever want, and still I await the hybrid gunslinger and ultra-aberrant with bated breath.